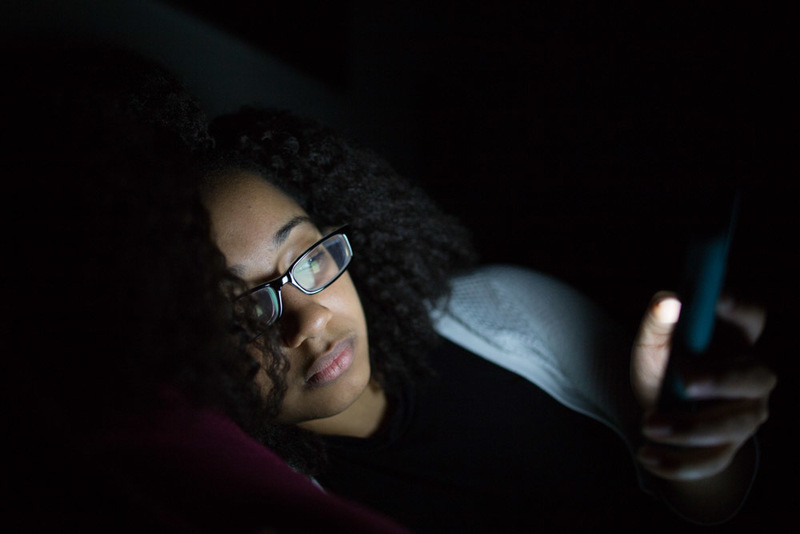 Staring At Smartphones In The Dark Can Mess With Vision : Shots - Health News Two women woke up to find they were blind in one eye. Then their eyesight quickly returned to normal. The likely cause? They had been gazing at their smartphone screens in the dark. Gazing at a smartphone in the dark can give people the feeling that they've temporarily lost vision in one eye. A 22-year-old woman in England thought she was going blind in one eye. She could always see fine out of her left eye. But on some nights, the right eye failed her. All she could see out of it were vague shapes in the room. At first, it happened about two or three times a week. Then it started happening every night. When she went to the doctor, her vision appeared normal. So did brain scans. But it was a disturbing trend. Around the same time, another woman noticed the same thing. On some mornings, she'd lose vision in just one eye for up to 20 minutes. It was bothersome enough to land her in the emergency room. Vision loss in one eye can be a sign that a person is having a small stroke, which is why one of the women was put on blood thinners and the other got a brain scan. It can also signal a compressed optic nerve. But after further investigation, researchers writing Wednesday in The New England Journal of Medicine think the problem is much simpler. They're calling the affliction "transient smartphone 'blindness.' "
"They were looking at their smartphones and they just happened to have one eye covered because they were lying in bed," says Omar Mahroo, an ophthalmologist at Moorfields Eye Hospital in London and an author on the letter. The first patient had a habit of gazing at her smartphone before falling asleep. She'd lie on her left side and look at the screen primarily with her right eye. Her left eye was often covered by the pillow. The other patient, who was in her 40s, had similar problems when she woke up in the morning before sunrise and checked the news on her smartphone before sitting up. It had been going on for about a year, ever since she'd injured her cornea. But around the same time, she'd bought an iPhone. In both cases, nothing bad was going on. Mahroo says. It's just that one retina was adapted to light, and the other to dark. "The retina is pretty amazing because it can adapt to lots of different light levels, probably better than any camera," he says. "It can reduce its sensitivity, so that when you're on the beach or in the bright snow you can still see relatively well," he says. In the dark on a clear sky, it can adjust to detect extremely dim, far away points of light like stars in the sky. Retinas constantly adjust when someone leaves a room and enters a slightly dimmer room, or goes inside after being outdoors. But these patients experienced a rare scenario in which that change would actually be noticeable. Here's how it happens: Light makes the pigment in rod-shaped cells change shape, which changes the electrical current running to another set of cells, which determines how much of a chemical those cells release to nerve cells, which eventually pass the message on to the brain. After exposure to a bright light, it can take 40 minutes for that process to reset, after which a person can again see in the dark. The researchers asked the two patients to do a little experiment, viewing the smartphone with just the left eye, then just the right eye on separate occasions. They realized that the eye going temporarily "blind" was always the one that was being used to look at the bright screen. The other eye was likely hidden by a pillow, blocking the light from the screen. To confirm the hypothesis, Mahroo and his colleagues did a little experiment on themselves. Mahroo went in a dark room and with one eye covered, gazed at a smartphone for 20 minutes before turning off the screen. "It did actually feel quite strange," he says of his self-experiment. "It would be very alarming if you didn't know what was going on." Then, he connected himself to a device that measured the current flowing in the photoreceptors in his retinas using electrodes. And sure enough, after flashes of dim light, the retina that had been exposed to the screen took longer to adjust to new light settings. "The retina is like a minibrain in our eye, and we're still trying to understand what goes on there," says Mahroo, who studies the cascade of cell communication that happens constantly between the retina and the brain. Mahroo says since he and his colleagues made their finding, multiple other patients have said they experienced concerning vision loss because of smartphone use. So, should you not read a phone with one eye in a dark room? "We don't know of any ill effects," Mahroo says. But it can be jarring. OK, this next bit has nothing to do with smartphones. But Mahroo says there's an urban legend that speculates that pirates' eye patches could have been used to manipulate vision. "Wearing an eye patch allows the eye that's covered to be in a constant state of darkness, which keeps the rod cells in that eye at their maximum sensitivity, what we call 'dark adapted,' " Mahroo says. "So simply by wearing an eye patch in bright light, and then, when in the dark, switching it over to the other eye, a pirate should, in theory, have instantly been able to see well in the dark." That of course presumes that the pirates were hip to the effect, and not merely wearing an eye patch to cover the unfortunate result of a sword fight.